Baltimore County Police will close Honeygo Boulevard at approximately 9:45am for the parade. Honeygo will reopen once all pedestrian traffic has been cleared – at approximately 12pm. Parade spectators can access THE AVENUE lot via the Honeygo entrance near Chili’s (prior to 9:45am), Corporate Drive entrance at the rear of AC Moore and all 3 entrances on Town Center Drive. The Honeygo entrance by Don Pablo’s will be utilized for Parade Participants ONLY. At the parade’s conclusion, spectators will be directed to exit the lot from the 3 exits onto Town Center and 1 exit onto Corporate Drive. Exits onto Honeygo Boulevard will be opened by Baltimore County Police after opening Honeygo Boulevard to vehicle traffic. It just wouldn’t be the holiday season with The Avenue at White Marsh’s annual tree lighting ceremony and holiday parade. The 2016 dates have just been announced, so mark your calendars. There will also be a new celebration added this year. 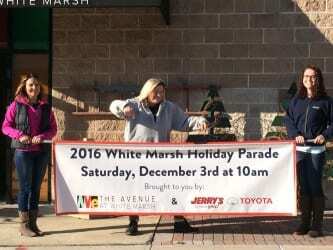 The Avenue will once again play host to the area’s 19th Annual Holiday Parade on Saturday, December 3rd at 10 a.m. There will be local high school marching bands, street performers, mascots, dance troops and much more. The festivities will be capped off with an appearance by Santa Claus himself. There will also be kids-eat-free meal deals from participating restaurants and some holiday shopping deals. Attendees will also be able to visit with Santa and the Mrs. in front of the tree. On Saturday, December 31st, The Avenue will begin a brand new tradition of ringing in the New Year with the 1st Annual Noon Year’s Eve Celebration! This event, geared toward families with young children, will include live musical entertainment and a countdown to 2017 complete with ball drop at noon. The event will begin at 10 a.m. This year, due to the ongoing construction at The Avenue, the Tree Lighting Ceremony will be incorporated in the Holiday Parade itself. So, on Saturday, December 3rd – as Santa and Mrs. Claus ride through the plaza – the confetti cannons will be fired and the tree will be illuminated. The tree will remain lit through the holiday season. For those who really want to plan ahead, The Avenue has announced that its 2017 Tree Lighting will take place on Friday, November 17th.